Adnan Oktar started a Twitter Campaign for Abdel Qader Molla, the Assistant Secretary-General of the Jamaat-e-Islami, who is expected to be executed tonight. Tens of thousands of people gave support to the Campaign including outstanding officials of the state. Upon this call, the entire world raised with their voices. Local and foreign politicians, journalists, human rights organizations all over the world gave support to the hashtags immediately. Right after the announcement of the hashtags, the decision for execution was postponed to the next morning and the Minister of Foreign Affairs, Mr. Ahmet Davutoğlu initiated the negotiations. 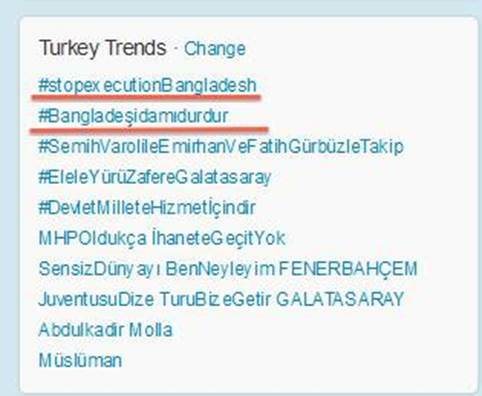 The hashtags #stopexecutionBangladesh and #Bangladeşidamıdurdur which were started by Mr. Adnan Oktar in his live broadcast on A9 TV became Top Trend in Twitter and this way he brought together significant politicians and officials from the Minister of Foreign Affairs on his side. While Abdel Qader Molla, one of the leaders of the Jamaat-e-Islami, whose execution is postponed to tomorrow morning had not found much place in Turkey’s agenda, suddenly changed the agenda by means of the Campaign Mr. Adnan Oktar started in his live broadcast. 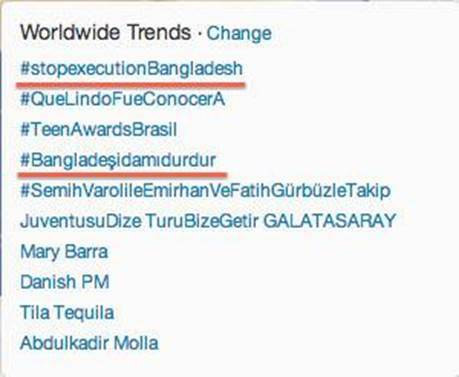 Tens of politicians, journalists and foreign minister officials retweeted the hashtags #stopexecutionBangladesh and #Bangladeşidamıdurdur all over the world. DİDEM ÜRER: According to information received from TIMETURK, Abdel Qader Molla who was given a life sentence by international war crimes tribunal in February will be executed tonight. He was given a verdict of death penalty with the claims that he committed crimes against humanity during the war of independence in 1971. He was the Assistant General Secretary and rejected all the allegations. He had made an appeal to Supreme Court for the cancellation of the execution. But, they have decreed to execute him tonight. ADNAN OKTAR: #BangladeşİdamıDurdur, let us see the English also. #BangladeşİdamıDurdur. Can we see that on the television screen? Everyone should give support for this. This is an immense oppression. Decrees for execution are being abolished all over the world. What is his crime? For what reason are you hanging him? Particularly, the English is very important. 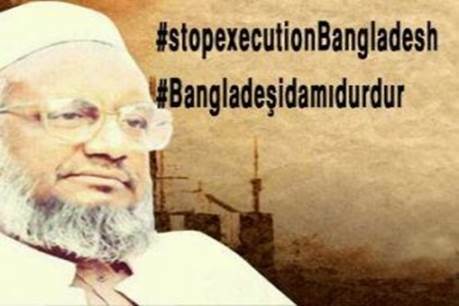 #stopexecutionBangladesh. Our friends should give emphasis to this everywhere. Let us especially keep the English hashtag on the agenda. Make this number one in the world, so that they will pay attention, insha’Allah. Rosendaal Mayor Mr J.A.M. Hans Verbraak was introduced and presented Atlas of Creation. He has given great interest to this valuable book which is available in 16 languages and he expressed that he would like to give his support to the related works. Following the decision of the Egyptian cabinet to intervene in the demonstrations carried out by the proponents of Morsi, during his live broadcasted program on A9TV Mr. Adnan Oktar called the whole world to say "No" to the probable massacre that might be carried out against the demonstrators in the Al-Adewiya and Nahda Squares. Yesterday Egyptian Ministerial cabinet instructed the Minister of Interior Affairs [of Egypt] Mohammad Ibrahım to evacuate Al-Adewiya and Nahda Squares. In the written statement issued after the meeting of the Ministerial Cabinet, it has been stated that "minister of Internal Affairs Mohammad Ibrahim is instructed to take necessary precautions to put an end to ensure public security and to put an end to the dangers." However the details of the task assigned to the Minister of Internal Affairs were not announced and it was not made clear whether or not the anti-coup demonstrations would be dispersed using force. This decision evoked the question "Is the Egyptian Army making preparations for a new massacre?" among the demonstrators in Nahda and Al-Adewiya Squares and among some circles closely following the developments in Egypt. Following the mentioned statement of the Egyptian Ministerial Cabinet, on his live broadcast program on A9TV on the night of July 31st , Mr. Adnan Oktar said "This might be a preparation for another massacre against Muslims in Nahda and Al-Adewiya Squares; so let us start a hashtag on Twitter saying #MısırdaKatliamaHayır #NoToMassacreinEgypt. Our brothers and sisters should spread this hashtag in rapid succession". After this announcement of Mr. Adnan Oktar, thousands of Mr. Adnan Oktar's followers on social media and thousands of Twitter users on the side of Muslims in Egypt supported this hashtag. And both of those hashtags appeared as the first topic on both Turkey and Worldwide TT Lists. ]]>http://secretbeyondmatter.com/en/Harun-Yahyas-Influences/166381/mr-adnan-oktar-called-thehttp://secretbeyondmatter.com/en/Harun-Yahyas-Influences/166381/mr-adnan-oktar-called-theThu, 01 Aug 2013 11:08:12 +0300Just like Adnan Oktar stated previously, the world's leading economists now say the crisis will not end before 2014In his statements Adnan Oktar has said that the economic crisis that has affected the whole world began in 2007 and will come to an end in 2014. In the wake of Adnan Oktar's statements the world’s leading economic institutions, especially the IMF, and economists have issued similar announcements. For example, a report by the IMF stated that the national revenues of many countries, including the USA, Great Britain and Ireland will only begin to rise again as of 2014. The deputy Japanese finance minister said that there might be some improvements during this process, but that these will be temporary, and that the crisis will persist until 2014. Adnan Oktar has also been expressing this reality in statements and on various TV channels ever since November 2008. Mr. Oktar's analyses and statements have once again been shown to be highly accurate. 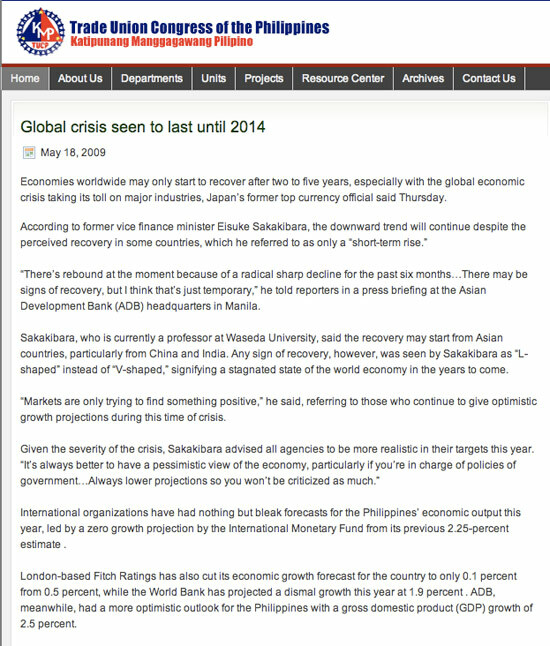 ABC News, 14 May 2009, "GLOBAL CRISIS SEEN TO LAST UNTIL 2014"
ADNAN OKTAR: Indeed, our Prophet (saas) has set out in some detail how this economic crisis will take place in the time of Hazrat Mahdi (as). He said it in the hadith. Look, let me tell you one of them. “Stagnation in the markets and bazaars is one of the portents of Doomsday. I said, what does stagnation in the markets mean? These things, complaints of low earnings is a portent of the coming of the Mahdi (as), that and great storms…” This is one of the major portents of the End Times and will last a long time, according to the hadith and the indications in the Qur’an. There was a famine in the time of the Prophet Yusuf (as), as you know. That is referred to in Surah Yusuf and there are allusions to the Prophet Yusuf (as) attaching importance to agriculture. For example, the surah refers to oxen and wheat, the importance of the ox in livestock raising and of wheat in agriculture, storing wheat and using it economically, avoiding waste in other words, and a timing with a seven. AND THIS CRISIS ALSO BEGAN WITH A SEVEN, IT BEGAN IN 2007 AND WILL CONTINUE UNTIL 2014. REPORTER: What do you say about the global, financial crisis centered in America and that is plaguing the whole world? 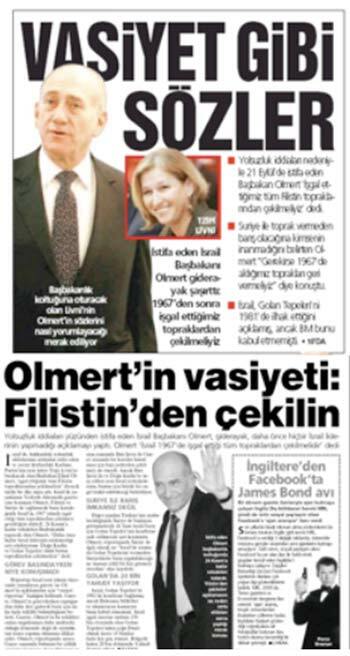 Are there political plans and ruses behind it, Mr. Oktar? ADNAN OKTAR: No, this is an economic crisis described by our Prophet (saas) as occurring in the End Times. This is widely indicated in the Qur’an. Almighty Allah says, “Wherever We have sent a messenger we have produced economic crises and high costs of living so that people there will beg for help.” Would America want to be in that position? The wealthy in America are currently in desperate straits. They do not oppress and humiliate themselves that much. Banks, workplaces and factories are folding one after the other. And there is total panic in America, Russia and China. And they cannot stop it. They are falling like dominoes, one after the other. This is not something that can be stopped. It is one of the events before the coming of Hazrat Mahdi (as) in the End Times. It is one of the portents of the coming of Hazrat Mahdi (as). It is an event that will engulf the capitalist system, it will swallow the whole system in the way the Prophet Musa’s (as) staff swallowed the snake. And nobody will be able to withstand it. IT BEGAN IN 2007 AND WILL LAST FOR 7 YEARS. It will lead to global famine. That is why it is indicated in the Qur’an. The Prophet Yusuf (as) says, “Store wheat, because there will be famine.” “And after famine there will be abundance” he says. REPORTER: Do you foresee a particular timing regarding this? 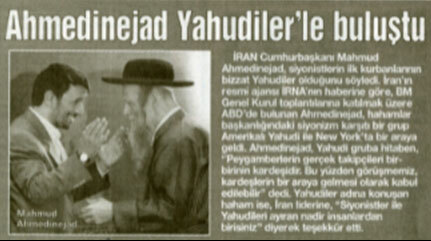 ADNAN OKTAR: IT STARTED IN 2007. THIS CRISIS WILL CONTINUE UNTIL 2014. I say that Hazrat Mahdi (as) will be physically visible in 2014. ADNAN OKTAR: It will swallow them all. This is a devastation that will last for 7 years. Allah will destroy them all within 7 years. Watch the papers and the television. You will hear reports every day, reports about somewhere collapsing, and this will not stop for 7 years. PRESENTER: Countries have even gone bankrupt. ADNAN OKTAR: IT BEGAN IN 2007. IT WILL SWALLOW THEM, SWALLOW THE WHOLE SYSTEM, UNTIL 2014. And they will be very poor and helpless, and will bend the knee and beg to be saved. And famine will emerge as a result. So they will have nothing, no goods or possessions, to boast about or show off with, to be proud and arrogant over, and none of their own glory. Like Kharun, Allah will bring down their whole system. The story of Kharun in the Qur’an is happening now in the End Times. In other words, all of Kharun’s treasure is now sinking. Kharun’s treasure was very famous, as you know, and the Qur’an describes it as very great. It says his power, his economic power was very great. And these people’s economic power was very great. But they have now entered that period of famine referred to in Surah Yusuf. Adnan Oktar: That means there is something wise and important, if it has reached their ears in waves in this way. And they are now saying this. As I remember, a columnist on daily Aksam also says it will last between 7 and 10 years, and his statement came weeks after mine. That means they have understood correctly. That means that such an opinion has formed in America and in Turkey, and shows how correct those words were. Presenter: This is just the right time to ask. Why 7? Adnan Oktar: This is described comprehensively in Surah Yusuf. Seven years of famine, 7 years of plenty. THE CRISIS BEGAN IN 2007 AND WILL CONTINUE UNTIL 2014. In 2014 we will feel the presence of Hazrat Mahdi (as). Nobody will be able to say he has not felt him or understood. They will understand very clearly. There will be a 7-year period of awakening and coming to life from 2014 to 2021. 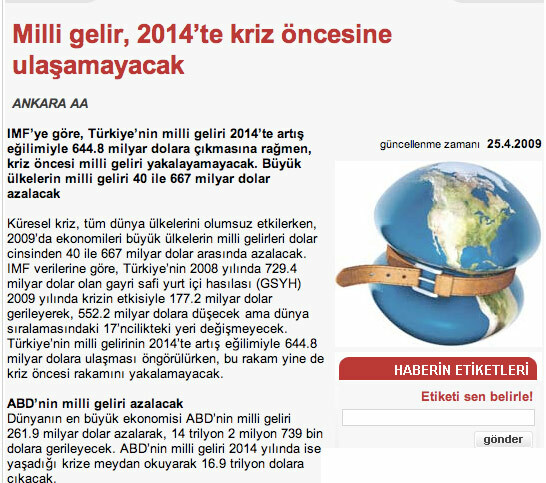 "GLOBAL CRISIS SEEN TO LAST UNTIL 2014"
ADNAN OKTAR: But note that all these marvels will keep on happening. For example, I said that it would not rain, and the rains have not come. They immediately came up with a pretext, blaming it on global warming. So why are all the dams full? The dams are full to bursting. Last year there was a drought. But now they are full up and there is plenty of rain. The same as in the hadith. So where does global warming come in? This is a feature of the End Times. A feature of the time of Hazrat Mahdi (as). We are told this will happen in the time of Hazrat Mahdi (as). It has happened at just the right time. 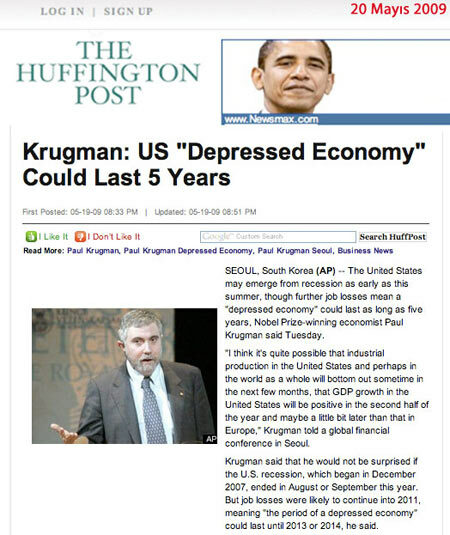 And the date when the crisis started is just right, 2007, and it will last for 7 years. It will continue until 2014. The date when it started is crystal clear. Look, I am telling you it will destroy the capitalist system. Every day another large company collapses, every day, literally, a state goes under; states are going under. ADNAN OKTAR: Even if America had all the boron mines in the world that would still not be enough to save it. Let me state it openly, America’s position is catastrophic. Europe’s position is catastrophic. China and Russia will all collapse. There is absolutely no way out, and they have collapsed even as of now. THEY HAVE COLLAPSED RIGHT FROM THE OUTSET. THIS WILL KEEP ON INCREASING UNTIL NEXT YEAR, BUT I EXPECT AN EASING IN 2013, AND INSHA’ALLAH IT WILL STOP AFTER 2013, IN 2014, BY ALLAH’S LEAVE. You will see it happen just like I have said. But there will be huge wealth in around 2021. Really extreme wealth. People will have so much they will have nothing to spend money on. But this will be with the abundance from Hazrat Mahdi (as) and the Prophet Jesus (as), insha’Allah. Tell our brothers to put this CD away. The period from 2013-2021 will pass very quickly, in the blink of an eye. Tell them to hide the CDs of this interview in their homes. They will see it all happens exactly as I have said. Exactly. We are in a metaphysical age. ADNAN OKTAR: But the economic crisis is of course a portent of the time of Hazrat Mahdi (as) in the End Times. This will happen in the time of Hazrat Mahdi (as). In the Qur’an, Almighty Allah says, “Whenever We sent an messenger (a warner, a Mahdi) We have also produced an economic crisis so that they should beg (return to Allah, surrender to Allah. )” Allah says He has produced high costs of living. He says He has given rise to famine. This is the greatest and most important of events, this event in the End Times. It is a global phenomenon. It will grow and grow. It is growing apace now. Let me say it will be even more severe this year. It will grow much worse. It began in 2007, as you know. 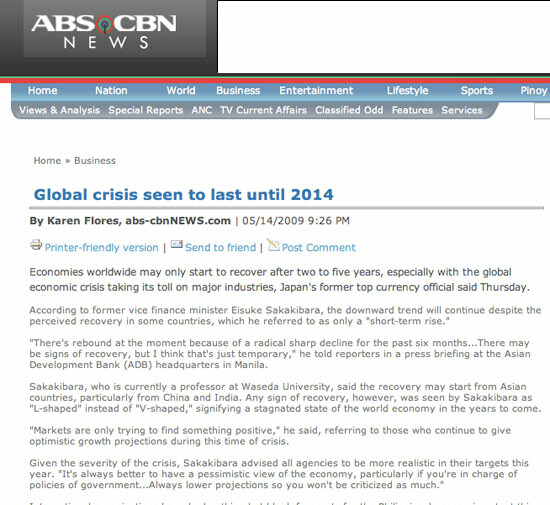 The crisis will start to slow down around 2013 in all likelihood, and will come to a total end in 2014. We will feel the presence of Hazrat Mahdi (as) in 2014, of his system. But we will see our Azeri brothers here around 2021, and our Kazakh brothers, our brothers from Turkestan, our Syrian and Iraqi brothers, and we will go to them, and the Turkish-Islamic Union will have been established. And there will be an amazing wealth, and amazing abundance, and peace and plenty, insha’Allah. ADNAN OKTAR: The characteristic of the Golden Age is that it is like a birth pain. The spread of corruption, terrible bloodshed, the invasion of Iraq, the invasion of Afghanistan, the occupation of Iraq by many foreign countries, bloodshed in Palestine and incidents in Jerusalem, our Prophet (saas) has described all these in detail. He says that Allah will be openly denied. Before the coming of Hazrat Mahdi (as), he says. There have been posters openly denying the existence of Allah on the sides of busses in England, so that has happened, too. I wrote about that 20 years ago in my book, describing that as a portent of the End Times, and it has happened to the letter. Out prophet (saas) says in the hadith that there will be an economic crisis, prior to Hazrat Mahdi (as), and that has come about. Hazrat Mahdi (as) will appear after all kinds of corruption, of strife and fire. Allah will make Hazrat Mahdi (as) His instrument in putting those fires out. That is his distinguishing feature, because if there is no fire, no strife, no slaughter and injustice, then Hazrat Mahdi (as) will not appear. This is the reason for Hazrat Mahdi’s (as) existence, the reason for his appearance. It is the reason for the coming of the Prophet Jesus (as). That is why such things are happening, in order to make people think, to draw them closer to Allah, and there is wisdom behind them all. For example, there was a war in Bosnia, but everyone became very devout. Everyone became devout as a result. There was a war in Iraq, and all those who used to puff on their hookahs, take drugs, go to the Communist Party and harbor Stalinist ideas have now all become Muslims. Syria is also full of devout believers now. Palestine used to be somewhere that communists were trained in. But now it is overflowing with religious believers. That means that troubles and suffering draw people closer to Allah and are instrumental in their turning to faith. These are all features of the time of Hazrat Mahdi (as). All these famine, scarcity and poverty will come to an end in the time of Hazrat Mahdi (as), and injustices will come to an end. An age of peace and security will come. But THIS ECONOMIC CRISIS BEGAN IN 2007 AND THE QUR’AN, THE HADITH AND THE TORAH INDICATE THAT IT WILL LAST UNTIL 2014. IT WILL LAST FOR 7 YEARS. It will be like the flood of Nuh, meaning that it will grow and expand all the time. 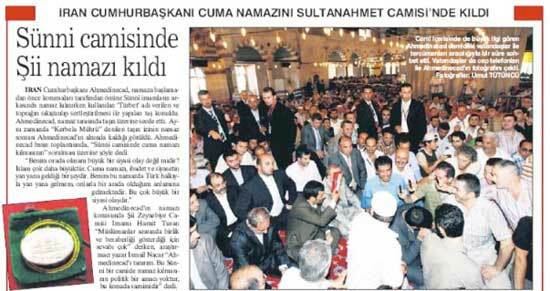 The only salvation from that flood is with the faith of the Turkish-Islamic world, gratitude and economy. ADNAN OKTAR: Now this crisis is a metaphysical one; all the economists, scientists, industrialists, capital investors in the world and everyone are desperately trying to put a stop to it, but they cannot and will not be able to. It will bring the entire system down. You will see that all the major companies in the world collapse, one by one. And this will go on for 7 years, which is not little time, 7 years. There will be famine in many countries. The Qur’an indicates as much. It suggests that wheat should be stocked and importance attached to livestock raising. As you know, the Prophet Yusuf (as) was in charge of the economy in his day. He said that famine would begin, and that it would last for 7 years. He therefore recommended that wheat be stored away, and stocks of wheat were made ready. And verses also point to the importance of raising livestock. Things happened just as the Prophet Yusuf (as) said they would. And there was a huge famine that lasted for 7 years. The same thing is happening again now. REPORTER: There was a major collapse on the London Stock Exchange in 1987. We are again looking at numbers connected to the figure 7. ADNAN OKTAR: The crisis began in 2007. The law of Allah is that it will last until 2014. And the crisis will persist until the whole global system has collapsed. And it will force people to see the might of Allah. PRESENTER: When will this union be completely established? ADNAN OKTAR: It will take a bit of time, in my view. I think it will take until 2014. That is what the course of events and history suggests. But my main scale of measurement is the hadith. That is what appears from the measures in the hadith. 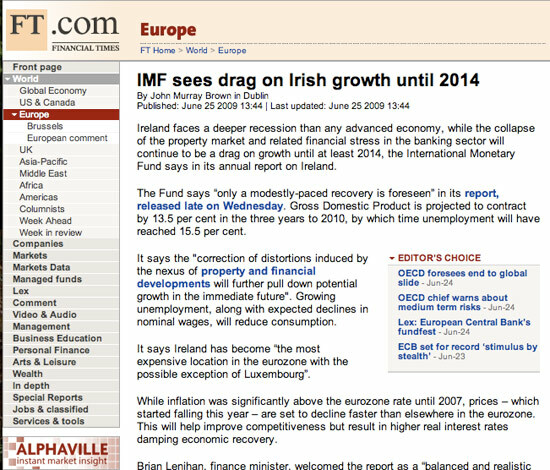 IN OTHER WORDS, THE ECONOMIC CRISIS WILL HAVE CALMED DOWN AND COME TO A STOP IN 2014. A strengthening and development will begin in political and economic terms, and the Turkish-Islamic Union will then become a reality, insha’Allah. "Turkey succeeds in bringing together for a second time [the leaders of] Afghanistan and Pakistan, who U.S. President George Bush could not even make shake hands in the White House." "Turkey will have put its name to another first." Reporter: Muslims are exposed to mass slaughter. Earlier in Bosnia. And now in Iraq, in Afghanistan and in Palestine. What do you think needs to be done? 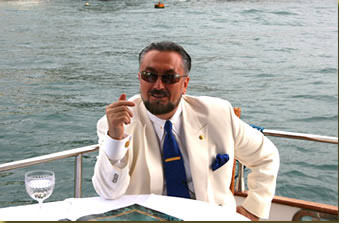 ]]>http://secretbeyondmatter.com/en/Harun-Yahyas-Influences/11874/as-adnan-oktar-has-saidhttp://secretbeyondmatter.com/en/Harun-Yahyas-Influences/11874/as-adnan-oktar-has-saidFri, 12 Dec 2008 15:04:17 +0200The impact of Adnan Oktar's statements encouraging the ideological struggle against DarwinismFor some 30 years, ever since 1979, Adnan Oktar has been waging a great intellectual struggle against Darwinism. And that struggle has been one of the main instruments in Darwinism’s intellectual collapse. In the 1970s, the level of people believing in Darwinism stood at some 90%, while today Turkey has the lowest level of belief in Darwinism in the world. Adnan Oktar’s more than 100 books on the subject of the theory of evolution, dozens of web sites and documentaries based on his works and hundreds of articles and newspaper announcements have of course had a great influence on this. All these activities have led to public awareness of the invalidity of Darwinism. 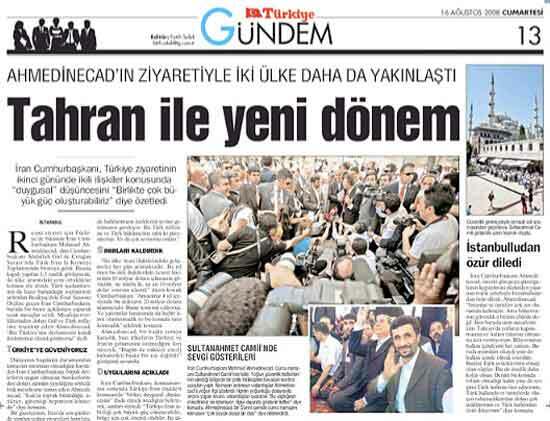 Mr. Oktar's works and scholarly activities have elicied an enormnous response, not just in Turkey but across the world. Leading Western scientific journals have described Adnan Oktar as an “international hero” on account of his work on the subject of Darwinism. The Atlas of Creation, one of his most recent works, in particular has been instrumental in causing panic among European and American Darwinists, and this magnificent book has been referred to as “a book with an earthquake effect,” “a book exploding like thunder” and “a book that has stunned the authorities” in the Western press. 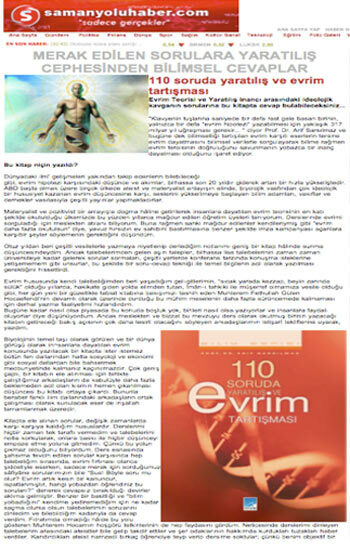 One subject that Adnan Oktar particularly emphasizes in these works that have such a profound impact and that he frequently refers to in interviews is that all Muslims must play an active part in the intellectual struggle against Darwinism. Adnan Oktar dealt with that subject on its own in his book The Importance of the Intellectual Struggle against Darwinism and frequently reminds Muslims of this significant responsibility incumbent them in interviews with various television channels and newspapers. These statements by Adnan Oktar in which he sets out the importance of the intellectual demolition of Darwinism at first place in order to properly preach the oneness of God and the moral values of the faith are having a greater impact with every passing day. Muslim thinkers, scholars, opinion leaders and large sections of the public have turned towards intellectual activities against Darwinism, especially of late. 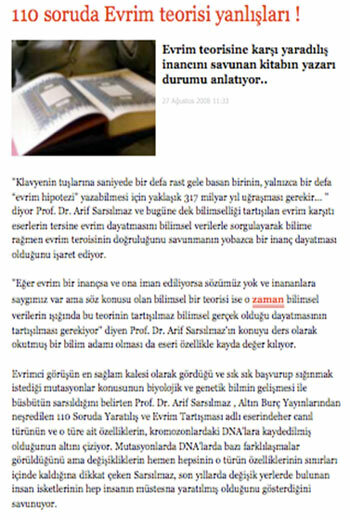 One of the latest examples of this is the book “The Debate of Evolution and Creation in 110 Questions!” by Prof. Arif Sarsılmaz. The existence of and increase in such activities is a significant development for the Muslim Turkish world and one of the important consequences of Adnan Oktar's 30 or so years of scholarly struggle. Adnan Oktar: Philosophy is of the greatest importance in this century. The philosophy of Darwinism, Darwinism and materialism, referred to as naturalism by Said Nursi, is the worst idol of this century. THIS GREATEST IDOL HAD TO BE BROKEN. AND WHAT I DID WAS TO BREAK THAT GREATEST IDOL. There was a real shock in Europe. All the foreign press in Europe, France and Italy announced this in amazement and astonishment. Great, clear results were obtained. We can see from public opinion polls that Darwinism has really collapsed in Europe. Thanks be to God. God has made such a success possible. That means that God grants success to scholarly activities if people are determined. We can see that, insha’Allah. Reporter: It is very interesting that to date no Islamic scholar has ever come out and opposed Darwinism and chosen to struggle against it. It is very interesting that not one has done so. Have they regarded it as unimportant, or is it you that regards it as so important? Why do you concentrate on this issue alone? What will happen if everyone give up Darwinism? Adnan Oktar: In my view Islamic scholars may not have become involved because they felt they could not defeat Darwinism intellectually. That is the truth of the matter. But I realized I could easily defeat it intellectually. And I have really done so. And how! They have been crushed, and I give thanks to God. Alhamdulillah. What you say is true, this is a theory that emerged in this century and no Islamic scholar has fully engaged in a comprehensive struggle against it in the way I have. There have merely been faint references. Vague mentions. And for that I give thanks to God. Reporter: What will happen when there is no more Darwinism, no more theory of evolution, when people no longer believe in it? Will everyone believe in God when no-one believes in Darwinism? Adnan Oktar: There can be no vaccuum. Belief will fill it. There is no other alternative. Adnan Oktar: That is the most crucial matter. MUSLIMS ARE GENERALLY UNAWARE OF THE SOURCE OF THE SCOURGE. IN OTHER WORDS, THERE IS ACID RAIN, BUT WHERE DOES IT COME FROM? FROM THE AIR? THIS ACID RAIN, THIS SCOURGE COMES FROM DARWINISM. Wherever Muslims are oppressed.... If there were no Darwinism there would be none of these forms of corruption. MPL: Is that where this corruption starts? Adnan Oktar: Of course, of course. Darwinism lies at the root of World War I, World War II, communism, fascism and all the terror at the moment. Darwinism is the main philosophy of Freemasonry. If you take away Darwinism, Freemasonry will be left up in the air. Communism will disappear. There will be no sense to fascism. ]]>http://secretbeyondmatter.com/en/Harun-Yahyas-Influences/10479/the-impact-of-adnan-oktarshttp://secretbeyondmatter.com/en/Harun-Yahyas-Influences/10479/the-impact-of-adnan-oktarsSat, 15 Nov 2008 13:28:59 +0200The impact of Adnan Oktar's messages of friendship and brotherhood: relations with Armenia are improvingIn his books and articles, statements in the press and at all other available opportunities, Adnan Oktar emphasizes the importance of friendship and brotherhood and stresses that all forms of dispute and other problems can be resolved immediately through love and dialogue. In recent television interviews in particular he notes that through the Turkish-Islamic Union friendship will prevail across the world, and that to that end Turkey and Azerbaijan must unite as two states, one nation. Adnan Oktar states that such a unification will be instrumental in bringing goodness and enlightenment to the whole region particularly in countries such as Armenia, Georgia and Russia, and goes on to describe how the various problems between Armenia and Turkey can be solved. He also states that the Turkish nation harbors no feelings of hostility toward anyone, that events of the past are best left in the past, that the 21st century will be an age of love and peace, that the Turkish nation has forgotten and forgiven the unfortunate incidents that happened in the past, and that the nation must treat its Armenian neighbors with love, tolerance and forgiveness. 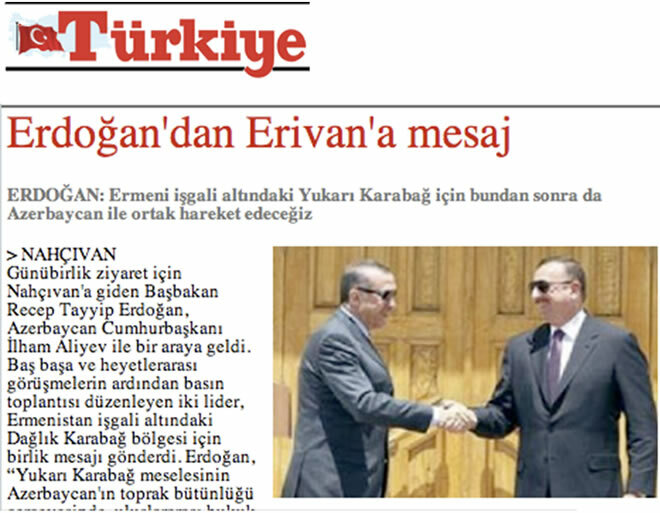 There have recently been very positive and welcome developments between the two countries, of exactly the kind described in the statements by Adnan Oktar. This became even more apparent during Turkish President Abdullah Gul's visit to Armenia. 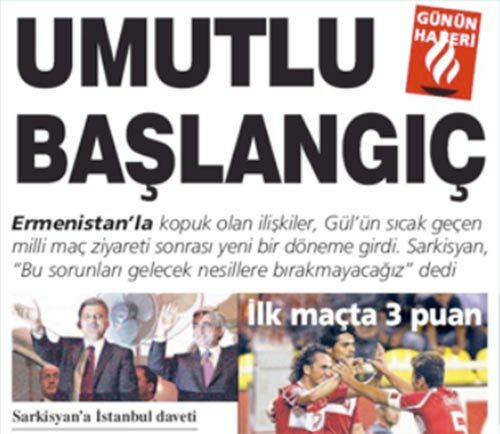 The way that the Armenians never referred to the so-called genocide during his trip, the way the lights at the so-called genocide monument were turned off, the way the Mount Agri logo was removed from the Armenian national football team’s shirts, and the way an official iftar meal was given for President Gül and his retinue are all very excellent developments. Current events also indicate that these positive steps will progress still further and that historic events will soon take place in the region. ]]>http://secretbeyondmatter.com/en/Harun-Yahyas-Influences/10478/the-impact-of-adnan-oktarshttp://secretbeyondmatter.com/en/Harun-Yahyas-Influences/10478/the-impact-of-adnan-oktarsSat, 15 Nov 2008 13:20:19 +0200Signs of the peace that Turkish-Islamic union will bring to the Middle East have begun appearingThe concepts of love and understanding represent very important effects of the Turkish-Islamic Union described by Adnan Oktar. Mr. Oktar has for years been setting out in detail in his books and articles the way that peace will come to the Middle East, and has frequently described, especially of late, how Muslims should regard Jews and how peace and justice can be brought to the region. As Adnan Oktar says, only through the foundation of the Turkish-Islamic Union can the difficulties and suffering of the Palestinian people come to an end, can Israel’s doubts and fears be resolved, and can all communities, Muslim, Jewish and Christian, live together in joy and security in these holy lands, the lands of the prophets. Because this union will be one of love friendship and will bring a solution to all disputes in the most just manner and by the most peaceful means. In his works and statements, Adnan Oktar describes how the Jews are the children of the Prophet Yakup, how they have the most legitimate rights to want to live in the lands of their ancestors and have the right to do business, worship and exist as they wish in those territories. Muslims and Christians also enjoy all those same rights, of course. These broad lands are big enough for everyone once feeling of brotherhood, peace and friendship have been strengthened, and there will be no need for conflict between anyone. 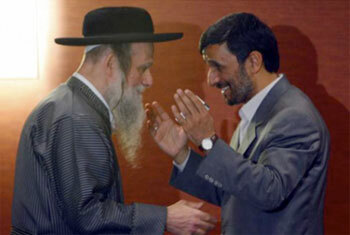 Muslims and Jews and Christians will live as brothers in these lands, just as in the time of the prophets. Discrimination, conflict and trying to remove another group from these lands are both totally unnecessary and totally incompatible with religious moral values. The Turkish-Islamic Union is the guarantee that both communities can live together in peace. This great union will allow both Jews and Muslims to enjoy the days they are longing for. Adnan Oktar's statements on this subject have had a major impact on both Jews and Muslims, have been instrumental in softening hearts and have led the way to the taking of peaceful and rational steps forward. One of the most recent examples of this is the significant and positive statements by Israeli Prime Minister Ehud Olmert, for long known for the harshness of his policies, which ran contrary to his previous remarks and policies. 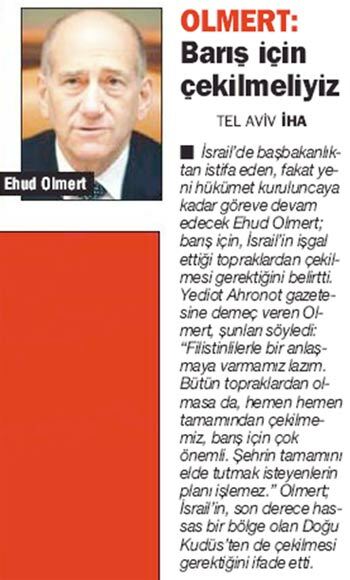 Olmert has said they are in favor of peace in the Middle East and might even withdraw from East Jerusalem is necessary. This is without doubt a very positive thing to say, and even the fact that the subject has been raised by a Jewish politician is a major step forward. 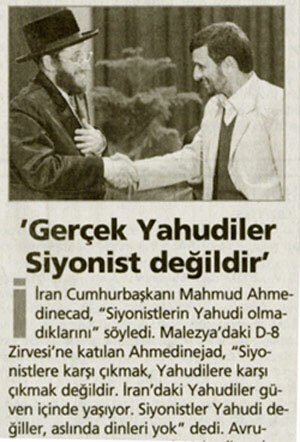 Adnan Oktar: Why should Israel be wiped off the map? They are the children of the prophets, the children of the Prophet Musa, the children of Yakup. Why should they be wiped off it? They pray to and beseech God in their synagogues. They worship day and night. Let them settle there completely. Let them live in peace and security. Let them build factories. Let us build factories and open facilities there. Let us be brothers. Let us draw close to one another. Let us set tables together. One can eat meat they have slaughtered. One can eat at their tables. One can be friends with them. One can marry their women. What does that mean? It means an interdependent life. What does it mean? It means brotherhood. So there can be no question of wiping off the map, but rather of consolidating the map right.. Many issues will be completely resolved, insha’Allah. 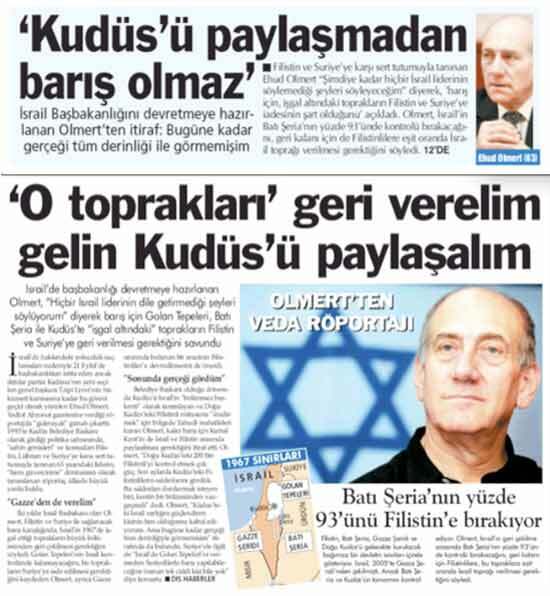 Olmert said: “We must come to an agreement with the Palestinians. Reporter: What will Israel do? Turkish President Abdullah Gül recently met with Azerbaijan’s President Ilham Aliyev and Armenian President Serj Sarkisyan in Kazakhstan. 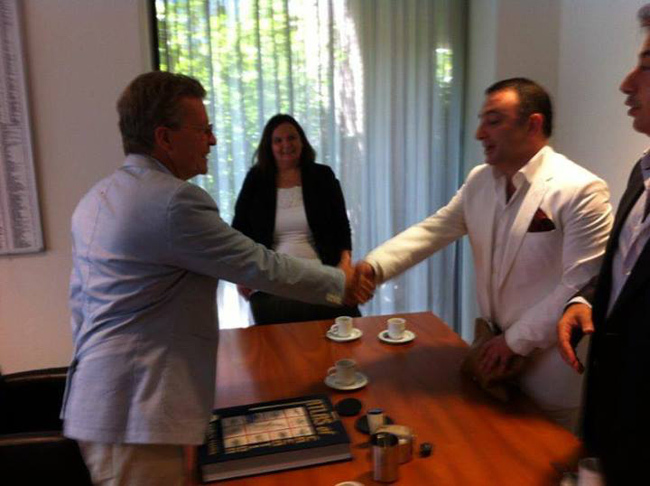 This friendly meeting was reported under the headline ‘The Long-Awaited Picture’ by daily Hürriyet on 6 July, 2008. In interviews, Adnan Oktar has frequently expressed the need for Azerbaijan and Turkey to unite as ‘Two States, One Nation’ and for Armenia to abandon its historic enmity and adopt an approach based on friendship and brotherhood. This objective has recently been reflected in newspaper announcements appearing under the heading ‘Azerbaijan and Turkey Must Unite As Two States, One Nation.’ These calls and announcements immediately began bearing fruit, and Azerbaijan, Armenia and Turkey were observed to come together in a hope-raising manner. This is of course a most welcome development. For years now, Adnan Oktar has been working hard as an opinion former for the Turkish-Islamic Union, the rise of Islam, and world peace and well-being. Statements from interviews by Adnan Oktar, the leading proponent of the idea of Azerbaijan and Turkey Uniting as one nation. Presenter: You want Turkey to be a country with its former power, governing the region as in Ottoman times. You want to be a country that shapes the direction of the world. Can Turkey reach that position? Adnan Oktar: This is in any case the legacy of centuries. All Islamic countries want this. All the Turkic states want it. Ask Azerbaijan, they want to be under direct Turkish administration. Azerbaijan says the borders with Turkey must be lifted and we should be a single state. Presenter: Let us move on to the subject of the Turkish-Islamic Union, which is so important to you. You want Turkey to play a leading role in the foundation of that union. You are working towards that end. Conferences have been held. Now will this be something like in the time of the old USSR or the former Yugoslavia, or what? Adnan Oktar: No, no. It will be a union of hearts. In the Turkish-Islamic Union I have in mind, all the states will remain as nation states. All of them. This will be a union of hearts, in other words a union of love, a union of dialog and of shared ideas. For example, taking a joint decision and eliminating terror when it raises its head somewhere. Taking a joint decision to resolve an economic difficulty. Taking a joint decision, for example, to rescue a country in a state of economic collapse. Presenter: What are your views regarding Azerbaijan? You know that, as with some other states, parts of Azerbaijani territory are under occupation. There is the area of Karabagh. Before we started our interview you referred to the Lachin corridor. It came as a real surprise to us that you should even remember the name. Because most people do not know it. What do you think on the subject? About the Armenian occupation, their seizing our territory? Then we had the Karabagh problems and the Hocali genocide after that. Adnan Oktar: The question of the Lachin corridor has been a source of distress to me for years. It must absolutely be opened up at once. Two states, one nation. For one thing, both parties are Turkish, both parties are Muslim. The difference between them is completely artificial. It is like Ankara being separated from Konya. The separation of the two countries is no more logical than that. The Karabagh question must be resolved at one, by rational negotiations with Armenia. Because it would be in their interests, too. The last thing that Armenia wants is to find Turkey and Azerbaijan lined up against it. That would be the worst mistake. It must regard Turkey and Azerbaijan as friends and seek their support. That is why the immediate resolution of the Karabagh problem and the opening of that road and the corridor are so vitally important. That is the road that establishes the link to Turkey. It is crucial. And not impossible. It can be done very easily. It can easily be done with a diplomatic readjustment. We just need the will. Presenter: This has not been possible for around 10 years, now. Diplomatic moves are continuing. Adnan Oktar: Huge public pressure is required. You have to rouse Turkey, to rouse Azerbaijan, and even rouse Armenia. You have to say let’s open up this road. We can support Armenia to revitalize its economy. You come and work here, and we can come and work where you are. Come and work and grow as you like in Azerbaijan. And let Azeris work in your territory. Let this unjust occupation be ended and the road be opened up. Let two states, one nation be formed. Presenter: In other words, the first step toward the foundation of the Turkish-Islamic Union will thus be taken. Adnan Oktar: It is crucial. This is the first fruit. - THE CAUCASUS MUST FINALLY BE SORTED OUT: We share the same views as Mr. Aliyev on the subject of co-operation for peace, stability and well-being in the southern Caucasus. The resolution of the Upper Karabagh problem in the framework of Azerbaijan’s territorial integrity is the most pressing matter that we also wish to see resolved. - TURKISH SOLIDARITY: The solidarity between Turkey and Azerbaijan is a role model in the Turkic world. If there is no solidarity between us, then the idea of ‘two separate states, one nation’ cannot become a reality. We must always make this a reality. Aliyev also said the Turkish and Azeri policies were ‘completely in harmony’ on all subjects. Aliyev said that a meeting of this kind in Nakhchivan was of the greatest importance, and concluded: ‘Because Nakhchivan is the only region lying on the land border between Azerbaijan and Turkey. Turkey played a major role on behalf of Nakhchivan when it was besieged by Armenia in the crisis period during the 1990s.’ ]]>http://secretbeyondmatter.com/en/Harun-Yahyas-Influences/10361/the-impact-of-the-announcementshttp://secretbeyondmatter.com/en/Harun-Yahyas-Influences/10361/the-impact-of-the-announcementsThu, 13 Nov 2008 13:51:11 +0200The light of the Turkish-Islamic union will illuminate east TurkestanIn recent statements Adnan Oktar has imparted the welcome news that the Science Research Foundation (BAV) and the Foundation for the Preservation of National Values would be making a great cultural offensive for the foundation of the Turkish-Islamic Union and for all Muslims in difficulties to attain peace and security. This cultural activity, including informing and educating the public on such matters as the importance and urgency of the Turkish-Islamic Union, the kind of union it will be, and the solutions it will bring to existing problems, has already begun to have an effect. 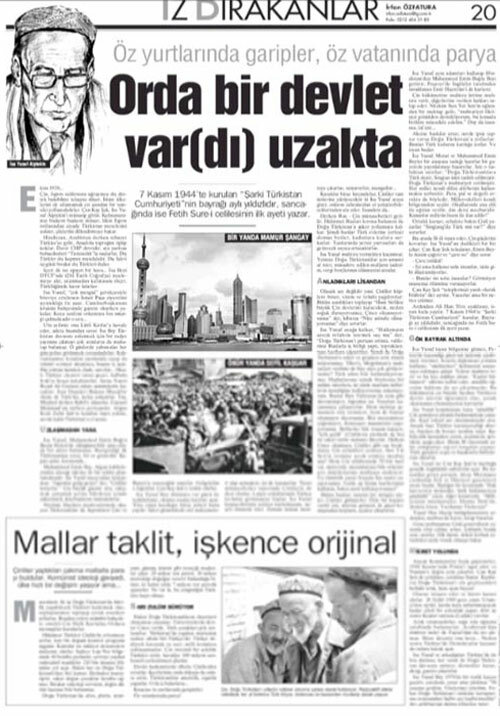 In addition to crucial developments taking place in the Caucasus and the Middle East, the question of East Turkestan, which had for a long time been almost entirely forgotten, has once again begun being raised in the Turkish press. Asia RFA: You mention this in your book Communist China’s Policy of Oppression and East Turkestan, but since 1949 China has executed millions of Muslims among its own citizens, but when we look at the media what we see is the U.S. invasion of Iraq, Afghanistan and later Palestine. Work out how many people are being killed every day. But the most painful thing today is the thousands of people in East Turkestan executed and including just for writing books or poems. Tens of thousands of people, but the world is silent. Why? 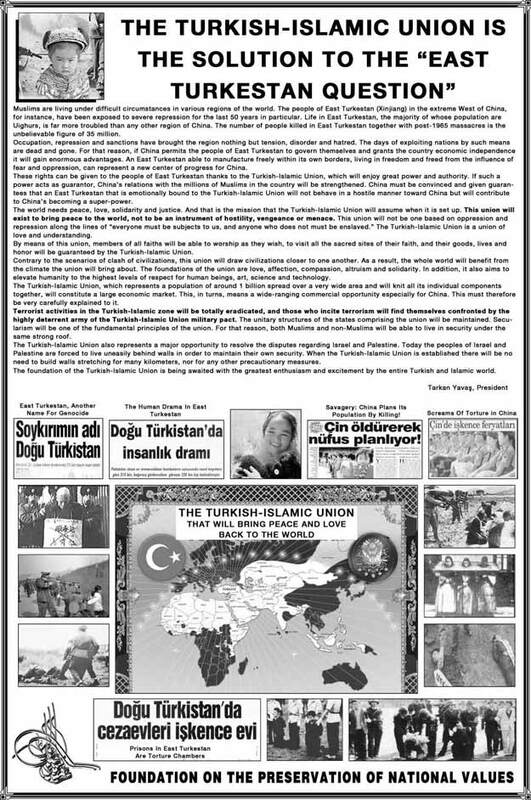 In the last few months, both Adnan Oktar’s statements on the subject and also announcements issued in various newspapers on the subject of East Turkestan by the Foundation for the Preservation of National Values, of which he is honorary president, have begun to bear fruit. 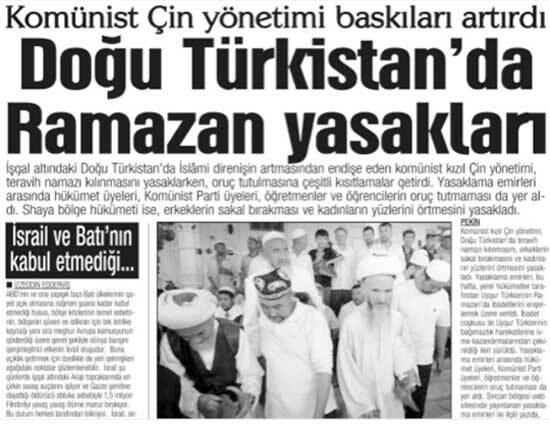 The press have again begun carrying stories regarding East Turkestan, and the Turkish public have started being made aware of the troubles and sufferings of their brothers in those lands. This information again raises the issue of the urgency of the establishment of the Turkish-Islamic Union and accelerates the steps being taken on that road by means of it. 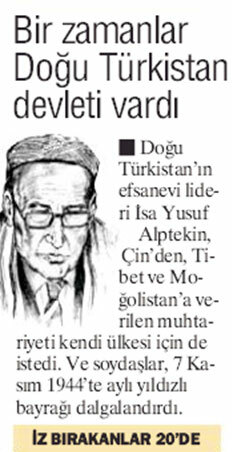 By God’s leave, it will be through the Turkish-Islamic Union that East Turkestan achieves well-being and enlightenment. With the foundation of the Turkish-Islamic Union, both East Turkestan and China will be able to breathe easy, and tension, fear and doubt will give way to peace, love and prosperity. 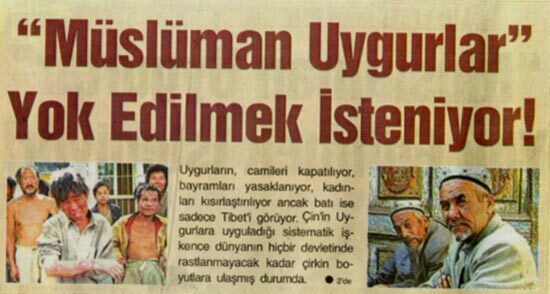 The Turkish-Islamic Union acting as guarantor will also strengthen relations with the milions of Muslims living in China. An East Turkestan emotionally ties to the Turkish-Islamic Union will clearly also be in China’s interests. Asia RFA: In conclusion, is there anything you would like to say to the people of East Turkestan. What message would you like to send them? ]]>http://secretbeyondmatter.com/en/Harun-Yahyas-Influences/9655/adnan-oktars-work-is-bearinghttp://secretbeyondmatter.com/en/Harun-Yahyas-Influences/9655/adnan-oktars-work-is-bearingFri, 10 Oct 2008 15:52:00 +0300The enormous response to fossils demonstrating the fact of creationThe way that Adnan Oktar’s giant Atlas of Creation contained a succession of fossil specimens that totally discredited evolution permitted the subject of these fossils to be brought up so effectively for the very first time. Before fossil specimens began being used in this way in Adnan Oktar’s scientific books, the majority of the public were unaware that there were so many fossils all disproving evolution. Because nobody had ever before revealed the fossil findings in such a clear and accessible manner in such a way as to so comprehensively enlighten the public. Today, however, it is no longer possible to deceive with regard to evolution the public now that they have seen fossil specimens in exhibitions, books, pamphlets and posters (as well as the living specimens all around them). Let evolutionists attempt to create all the sensations they want, to write supposedly scientific articles using incomprehensible Latin terminology, or to use the media that support them as propaganda tools, the result will still be the same. It is now impossible to deceive anyone who has looked at fossil specimens and witnessed that living things have remained unchanged for tens of millions of years and that life forms dating back hundreds of millions of years are identical to their present-day counterparts using evolutionary myths. 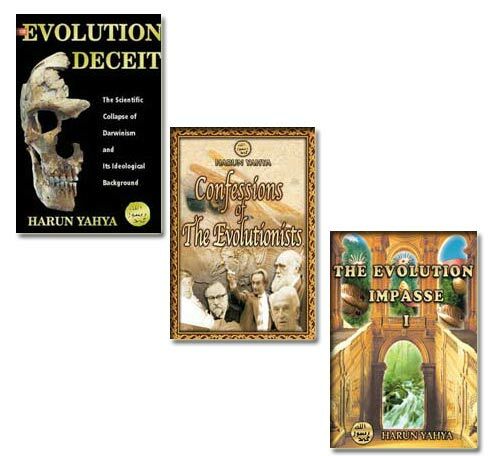 This scholarly work of Adnan Oktar's by which he has raised the issue of fossils onto the public agenda has dealt Darwinism a most deadly blow, and has been a means whereby the theory of evolution has been consigned to the back shelves of history across the world, including Europe and America. ]]>http://secretbeyondmatter.com/en/Harun-Yahyas-Influences/9515/the-enormous-response-to-fossilshttp://secretbeyondmatter.com/en/Harun-Yahyas-Influences/9515/the-enormous-response-to-fossilsFri, 26 Sep 2008 20:25:34 +0300Adnan Oktar's works have dealt a lethal blow to evolution One of the most significant characteristics of Adnan Oktar's works about the invalidity of Darwinism is that they demolish the theory of evolution using many different forms of proof and evidence, in a way that has never been employed before. The unscientific nature of the theory of evolution is described in such a way as to leave no gaps, with the provision of irrefutable, concrete and crystal clear evidence. Furthermore, all forms of technology and publishing are used to ensure these works are accessible to very large numbers of people. Reaching out to people through such means as books, articles, documentary films based on those books, audio tapes, web sites and conferences has never before been employed in such an intensive way. And that is why evolutionists treat these works with such great “concern.” Every scholarly work by Adnan Oktar provokes widespread reactions. Evolutionists’ reactions to these activities is directly proportional to the seriousness of the blow they deal to evolution. One of the indications of the matchless nature of Adnan Oktar's works and the huge impact they are having is without a doubt the way that evolutionists admit their defeat in the face of them. In a report on the www.pitch.com web site, for instance, the well-known evolutionist Professor Umit Sayin stated; "There is no war against the Creationists any more. They have won the war. 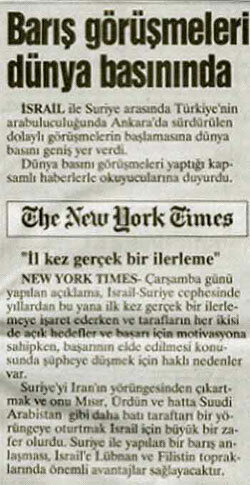 In 1998 I motivated six professors from the Turkish Academy of Sciences to speak against Creationists. But now it is impossible to motivate even a single person.” The report went on to refer to Turkey as a country in which the proponents of the theory of evolution had been almost entirely vanquished. ]]>http://secretbeyondmatter.com/en/Harun-Yahyas-Influences/9514/adnan-oktars-works-have-dealthttp://secretbeyondmatter.com/en/Harun-Yahyas-Influences/9514/adnan-oktars-works-have-dealtFri, 26 Sep 2008 20:13:10 +0300Africa is also heading towards the Turkish-Islamic unionThe Ottoman Empire, which at its height covered an area of 24 million km2, was a truly global empire that spread peace and security as far as Morocco, Tunisia and Algeria. Indeed, the security and well-being constructed under Ottoman rule are still remembered with love and aspiration even today. 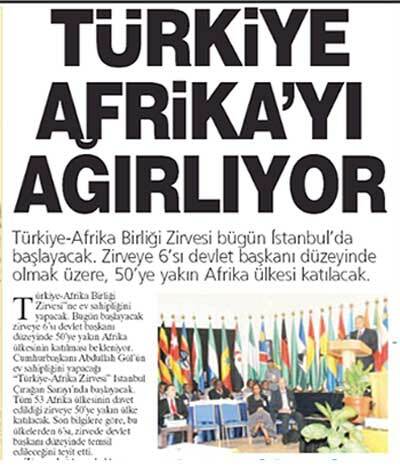 African states and nations, and not just those of North Africa, are looking to the foundation of an alliance under Turkish leadership and have embarked on a historic process. ]]>http://secretbeyondmatter.com/en/Harun-Yahyas-Influences/9513/africa-is-also-heading-towardshttp://secretbeyondmatter.com/en/Harun-Yahyas-Influences/9513/africa-is-also-heading-towardsFri, 26 Sep 2008 17:07:17 +0300The Caucasian alliance: a significant step towards the Turkish-Islamic UnionIn the wake of Adnan Oktar's wide-ranging scholarly activities and his statements stressing the urgent need for and importance of the foundation of the Turkish-Islamic Union, every passing day has begun witnessing further progress towards the realisation of the union. In the last few months, the setting up of the Turkic Union Assembly, the consideration of the Turkish-Islamic Union at sessions of the D8 and the Organization of the Islamic Conference, the increasing calls for union from right across the Muslim world, and Iranian President Ahmedinejad's behaviour and statements favouring a Sunni-Shiite alliance when he prayed behind a Sunni imam on a recent visit to Turkey are just a few such developments. Another significant development was added to the list last week when Turkey assumed leadership of a project that will bring peace and stability to the Caucasus. The project known as the Caucasian Alliance was made a reality with Turkish Prime Minister Recep Tayyip Erdogan's visit to Russia and subsequent trip to Georgia. 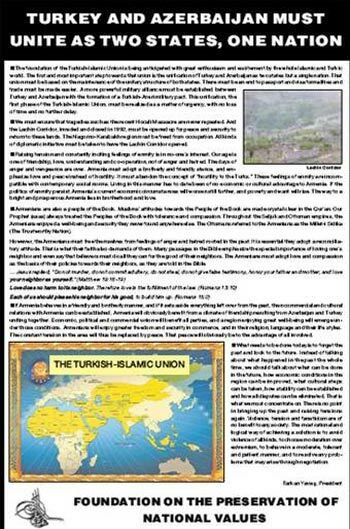 It is highly significant that this project took place immediately following Adnan Oktar's notice that the Turkish-Islamic Union would commence in the Caucasus. The Turkish-Islamic Union is a union of love. It is a union of affection, a union of hearts. The basis of this union are love, altruism, helping others, compassion, tolerance and understanding…. The Turkish-Islamic Union will bring peace to the world. The Turkish-Islamic Union will first and foremost resolve the disputes between Muslim countries and bring peace to the Islamic world; it will also oppose all those movements that incite war and conflict in the world as a whole, and will be a force capable of preventing all initiatives aimed at provoking war. Another noteworthy aspect of the reports about the Caucasian Alliance in the press were the invitation to friendship and to join the union issued to Armenia. 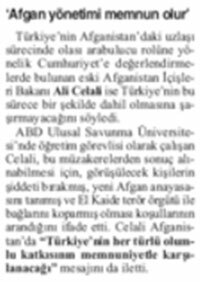 Shortly before that, a notice in the press based on the works of Adnan Oktar described the alliance between Azerbaijan and Turkey and emphasised the policy to be followed in respect of Armenia. This notice spoke of the need to look towards the future, setting aside past disagreements, and said that a very important responsibility was incumbent on both sides. They particularly emphasised the need for Armenia to adopt a friendly policy and for it to enjoy friendly with its neighbours, and that the Turkish-Islamic Union was a development working to Armenia's advantage. They also stressed the need for the Lachin Corridor to be opened. Mr. Adnan Oktar has also concentrated on these issues in his interviews with the press. In the wake of these there began a rapprochement between Azerbaijan and Armenia, under Turkish guidance, of a kind never before seen. Turkey's policy has been to invite Armenia to participate in all cultural and economic investments and projects in the region. The Armenian leadership has begun issuing messages of friendship and issuing statements of a kind seldom observed before, saying that existing disagreements should be resolved by diplomatic means. Each one of these historic developments is a clear sign that, as Adnan Oktar has already made clear, major events will take place in the near future and that Turkey will assume a vitally important role in these. By Allah's leave, the time when a fully fledged union under Turkish leadership will come about is close at hand, and that union will benefit not only the Islamic word, but the whole planet. "There are two states but one nation. Both are Turks and both are Muslim. It is like Ankara being cut off from Konya. The one is just as logical as the other, as these two countries being divided from one another. The Karabagh issue must be resolved through rational discussions with Armenia. That will be to their advantage, because the last thing Armenia wants is to have Turkey and Azerbaijan lined up against it. That would be the worst possible mistake. It should regard Turkey and Azerbaijan as friends and seek their support. That is why it is vital that the Karabagh problem be resolved and the corridor opened up at once. This is my no means impossible, but is really very easy. It can easily be done with a diplomatic initiative, but we need to insist on it. Let us open the corridor up. Let us support Armenia. Let us regenerate its economy. Come and work in Turkey. And we will come and work with you. Come and develop yourselves however much you like in Azerbaijan. Let Azeris go and work in your country. But let us also resolve that problem. That unjust occupation must be ended. Let us open up the road ahead. Let us have two states and one nation." 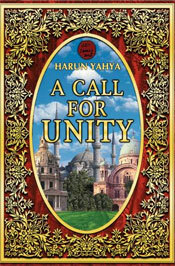 ]]>http://secretbeyondmatter.com/en/Harun-Yahyas-Influences/9477/the-caucasian-alliance-a-significanthttp://secretbeyondmatter.com/en/Harun-Yahyas-Influences/9477/the-caucasian-alliance-a-significantWed, 24 Sep 2008 21:33:00 +0300Muslim countries' support for one another is on the increaseFeelings of solidarity, brotherhood and friendship, longed for over so many years, have increasingly begun dominating the Islamic world. Just about every day the newspapers report statements from politicians and other eminent figures regarding the need for Muslims to ally themselves together. Every day, a great many cultural and economic steps are being taken to accelerate unity within the Turkish-Islamic world. All these developments are signs that, by the will of God, the establishment of the Turkish-Islamic Union are close at hand. In his books and in press and television statements, Adnan Oktar particularly emphasizes the importance of the foundation of the Turkish-Islamic Union and has recently in particular concentrated on the urgent need for this. 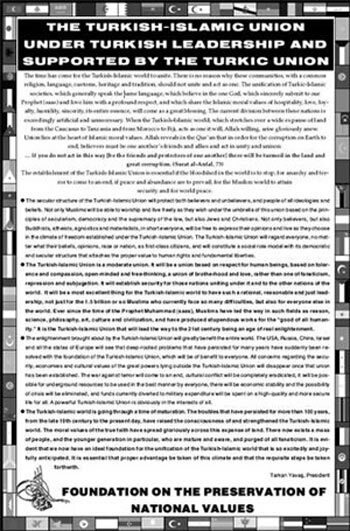 Announcements based on Adnan Oktar's works include such detailed statements as: "There is no reason why these countries, with a common tradition and heritage of religion, language and culture should not act as one," "Unity will be a great blessing and facility for Turkish-Islamic societies," "The current division and an exceedingly artificial and unnecessary one," "The implementation of the awaited union is a matter of great urgency" and "In the event that the Turkish-Islamic world acts in union and unity it will, by God's leave, rise up again." "Representatives of member countries of the OIC and the Arab Group have placed on record THEIR BELIEF THAT TURKISH MEMBERSHIP WILL CONTRIBUTE TO WORLD PEACE. It has been learned that while thanking Babacan for his efforts to make the Middle East a place of peace, the Arab Group and OIC member country representatives regard temporary Turkish membership as very good timing. IOC member country representatives also expressed their pleasure at seeing Turkey on their side on all matters, and it was noted that they greatly appreciated Turkish officials' quest for a solution to the problems of less developed countries." One of the most noteworthy aspects of these statements is that the Islamic world sincerely supports Turkish leadership. Adnan Oktar also notes in his statements the importance of Turkey's Ottoman legacy and has frequently emphasized that it is Turkey that will lead the Turkish Islamic Union. The current developments show that the entire Islamic world supports the unity, solidarity and Turkish leadership stressed by Adnan Oktar very sincerely. MPL: In addition to the theory of evolution, you are also very active regarding the Turkish-Islamic Union. You have made progress. They do want Turkey to lead it, do they not? But why should Turkey lead it? What does Turkey have to gain? ADNAN OKTAR: Turkey has the experience of state. It has the experience of empire. It is experienced in managing other countries. And it has the ability. The Turkish nation has also remained unsullied. I mean, Anatolia has remained morally uncorrupted. Anatolia has been preserved as it was. Its hospitality, cleanliness, moral virtues, pleasantness, humanity, conception of good neighborliness, compassion and altruism have remained as they were. Europe has lost these. Since these moral values still survive unchanged and since it is the Turks who best apply them, it would seem that it is the Turkish nation that is most able and best suited. I am not the only one to say this. WHICHEVER MUSLIM STATE YOU GO TO, THEY ARE SAYING THE SAME THING THERE, TOO. COME AND LEAD US... EVERYONE SHALL KEEP THEIR OWN STATE, BUT THERE MUST BE A SPIRITUAL UNION. THAT IS THE TURKISH-ISLAMIC UNION since all the Turkic countries are Muslim. This is huge element for equilibrium in the region. Its greatest advantage will be the immediate ending of terror. No such thing as terror will remain. Terror will be eradicated from the face of the Earth. Secondly, there will be an enormous economic revitalization. Most importantly, however, it will lead to peace and well-being. Everyone will be at ease, the atheist as well as the true believer. Christians, Jews and even Buddhists will enjoy greater ease in an Islamic society, a society in which Islamic moral values prevail. That is why it will be enormously beneficial for Islamic moral values to prevail in the region, in the Missle East and in the Turkish-Islamic Union. That is a matter of urgency. ADNAN OKTAR: This is favourable to America. Anarchy will come to an end as soon as an Islamic Union, a Turkish-Islamic Union is established. Terrorism will stop at once, and there will be great wealth and plenty. ADNAN OKTAR: TURKEY WILL BE A MAJOR STATE. INSHAALLAH, IT WILL LEAD THE TURKISH-ISLAMIC WORLD. Turkey is in any case free, but it will be even freer and more democratic. InshaAllah, it will be even better. KON TV: So you really believe that Turkey can occupy a leadership position in all these conditions? ADNAN OKTAR: Our nation is excellent in nature and QUITE CAPABLE OF LEADING. ]]>http://secretbeyondmatter.com/en/Harun-Yahyas-Influences/9413/muslim-countries-support-for-onehttp://secretbeyondmatter.com/en/Harun-Yahyas-Influences/9413/muslim-countries-support-for-oneSat, 20 Sep 2008 21:58:50 +0300Adnan Oktar's calls to union are becoming a realityFollowing on Adnan Oktar's recent concentration on the Turkish-Islamic Union, a most important, historic advance has been taken in Islamic lands, particularly the Middle East. Voices from Iran, Syria, Iraq, Palestine, Azerbaijan and all other Islamic countries saying “Let us unite at once, we are brothers and union is essential for Muslims” are louder than ever before. In addition, these are not limited to comments by writers or researchers. High ranking leaders of state and opinion-formers in Turkish-Islamic countries have begun referring to the importance of the Islamic Union more than ever before, and are even taking significant steps in that direction. Joint economic initiatives have been established, the number of joint investments has risen and joint assemblies have been founded. The common view of politicians and intellectuals is that the establishment of the Turkish-Islamic Union is now but a matter of moments. ]]>http://secretbeyondmatter.com/en/Harun-Yahyas-Influences/9404/adnan-oktars-calls-to-unionhttp://secretbeyondmatter.com/en/Harun-Yahyas-Influences/9404/adnan-oktars-calls-to-unionSat, 20 Sep 2008 03:04:10 +0300Harun Yahya's accounts of the dangers of social Darwinism have led to a major world-wide awakeningAdnan Oktar is an author who for many years has undertaken the mission of telling society about the scientific invalidity of Darwinism and its social dimension, which is totally opposed to religious moral values. The author describes this mission as follows in the introduction to his "Social Weapon: Darwinism." "... the dangers of educating young people in the light of Darwinism and of the theory's wide acceptance will be shown to people unaware of, or who ignore, the threat that it poses to societies and individuals." The author has published a great many books, articles, documentaries and web sites all intended to reveal the extent of the danger to society of educating young people in the light of Darwinism. (1) The author's works first spread through Turkey and then through the wider Islamic world, and he has now turned to telling Western society about the error that is Darwinism. The author has determined his strategy in the light of Darwinism having acquired a broad basis in which to spread in Western society in educational and cultural fields, and has thus written a work of unsurpassed quality in this area in order to illuminate Western societies in which that theory is so influential. In his Atlas of Creation, which contains thousands of illustrations, consists of some 700 pages and weighs approximately 7 kilograms, Mr. Oktar has again exposed the scientific invalidity of Darwinism, using the most concrete examples. In the Atlas of Creation, the author specially emphasizes the havoc Darwinism has wreaked on mankind, the most obvious manifestation of which he shows to have been the dependence on Darwinism in the slaughter perpetrated by a racist dictator such as Hitler, who caused the deaths of millions. This giant book was sent out by its publisher free of charge, for publicity purposes, to eminent individuals in various European countries and in the USA. Western Darwinists who discovered this magnificent volume in their mailboxes, one that openly declares the scientific falsity of Darwinism, were stunned. The campaign frequently appeared in Western media headlines, which compared the situation to Darwinism being subjected to "a sudden attack" on its home ground. The author's opposition to the one-sided teaching of Darwinism and his exposure of the link between Darwin and Hitler were frequently discussed in newspapers and on the television. The entry into Western society by a Muslim author with a book that elicited such profound responses, set the scene for a new phase in the intellectual struggle against Darwinism. Many Western references underlined the fact that it was not only Christians who espoused the fact of Creation in their struggle against Darwinism, and that Adnan Oktar, who has published books on the subject all over the world, must be acknowledged as the leader of a very powerful movement. It is inevitable in this new dawn that through Mr. Oktar the dangers of Darwinist education are now expressed much louder in the West and that many people will be encouraged to reconsider the whole subject, and that education policies will even be amended. The way that the subject entered the agenda in a letter written to one of the U.S. state of Florida's educational institutions bears a striking parallel to the account given in Atlas of Creation. The letter, written to a school board in St. Petersburg, described Hitler's dependence of Darwinism and expressed the view that it was therefore dangerous for students to be taught the theory of evolution as a supposed scientific fact. 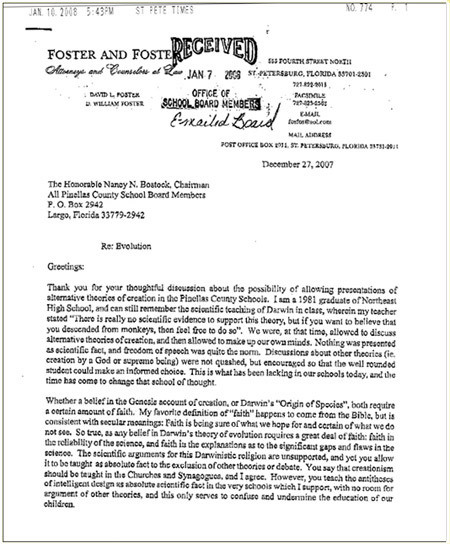 The letter in question entered the agenda with a report published in the 12 January, 2008, edition of the St. Petersburg Times titled "Foster links Darwin, Hitler." The subject matter of the article was a letter written to the school board by Bill Foster, a former City Council member. In his letter, Foster noted the dangers inherent in the theory of evolution being taught as a scientific fact, and demanded that the compulsory teaching of Darwinism be prevented. "Evolution gives our kids an excuse to believe in natural selection and survival of the fittest, which leads to a belief that they are superior over the weak ... This is a slippery slope." Foster's letter came on the eve of the state of Florida putting new science standards to the vote. These new standards regarded Charles Darwin's theory as the pillar of modern biology. The science standards that had been in force in the state since 1996 made no reference to the word "evolution." The state Board of Education was to vote on the issue on 19 February. "Adolf Hitler duped an entire generation using Darwin's evolution ... He sought to preserve the 'favored' race in the struggle for survival." "You know what I love? Natural selection! It's the best thing that ever happened to the Earth. Getting rid of all the stupid and weak organisms." In the wake of the 1999 shooting, Tom DeLay, a member of the US House of Representatives, cited Darwin's theory as a contributing factor and wrote in a letter that duly found its way into the Congressional Record that public schools "teach the children that they are nothing but glorified apes who have evolutionized out of some primordial soup of mud." The Columbine massacre was no exceptional attack carried out by students holding Darwinist views. In Finland, Pekka-Eric Auvinen, who described himself as a social Darwinist, shot 8 people to death at the Jokela High School some 40 miles from Helsinki, before killing himself. "I am prepared to fight and die for my cause. I, as a natural selector, will eliminate all who I see unfit, disgraces of human race and failures of natural selection. ... No, the truth is that I am just an animal, a human, an individual, a dissident. ... It's time to put NATURAL SELECTION & SURVIVAL OF THE FITTEST back on tracks!" The evangelical Christian group Coral Ridge Ministries, active in the state of Florida, produced a new TV special called "Darwin's Deadly Legacy." The film, aired on Christian cable networks and on some 200 TV stations in the country as a whole, described Adolf Hitler's dependence on Charles Darwin's theory of evolution with regard to the Holocaust. The alliance between Darwin and Hitler resulted in a tragedy responsible for the deaths of some 40 million. ]]>http://secretbeyondmatter.com/en/Harun-Yahyas-Influences/9380/harun-yahyas-accounts-of-thehttp://secretbeyondmatter.com/en/Harun-Yahyas-Influences/9380/harun-yahyas-accounts-of-theFri, 19 Sep 2008 23:11:00 +0300Adnan Oktar had made statements encouraging friendship and brotherhoodIn his books, other works and statements given during interviews, Adnan Oktar states that relations between societies must be grounded in friendship, love and brotherhood. Asked how an end can be put to the pain and suffering in Turkey's neighboring regions, he says that all problems can be resolved if approached in a spirit of love and compassion. Mr. Oktar frequently states that with the establishment of the Turkish-Islamic Union, conflict, fighting, anarchy and terror will be eradicated, and that not only Muslim societies, but also the whole of Europe, the USA, Russia, China and Israel will all find peace. He describes a system in which everyone, from any nation or from any faith, can live in peace and security. Once the Turkish-Islamic Union has been set up, there will be a climate in which Darwinist-materialist policies based on mutual oppression and exploitation, are entirely eliminated, and a prosperous, democratic, civilized and enlightened climate in which everyone can be happy and secure. Instead of a false system that maintain that one can only be strong by ruthlessly crushing and annihilating others, there will be a societal order that draws strength from mutual support, that draws wealth from mutual protection and develops with a sense of understanding and tolerance. The issue that Mr. Oktar particularly emphasizes is that from that unity and understanding will emerge comfort and security from which all can benefit and prosper. It is impossible for a society to be made happy by the oppression or suffering of others, and true happiness will come from living as friends and brothers. This model that Mr. Oktar sets out in his books, other writings and talks has elicited a wide response in Turkey and the rest of the world. One of the most recent indications of this was a speech by Turkish Prime Minister Tayyip Erdogan. In his “Address to the Nation” on August 30, 2008, the prime minister made comments entirely in agreement with the conception encouraged and described by Mr. Oktar. He said that Turkey's new foreign policy aim was to bring peace and stability to the region, for which reason the country had adopted a rational and balanced diplomatic path, and that a "co-operation from which everyone can benefit" lies at the heart of that policy. "We are trying to fulfill our responsibility to urge the parties to find a diplomatic solution with common sense. We say that NOBODY SHOULD SEEK TO BENEFIT AT THE COST OF OTHERS IN INTERNATIONAL RELATIONS. There can be no gain from conflict. Harming peace and stability in the Caucasus, in a way to incite deep conflicts, will have serious results for global peace and stability. We call on all parties to avoid a hostile power struggle in which everyone will more or less lose and have to pay a price; instead, we are calling for a competition based on CO-OPERATION, FROM WHICH ALL CAN BENEFIT." "Not a day must be lost in setting up the Turkish-Islamic Union. This will be to everyone's advantage, and will disadvantage neither NATO nor the European Union. IT IS TO THE ADVANTAGE OF THE WHOLE WORLD. CHINA WILL BENEFIT, AND RUSSIA, especially Russia. THE EUROPEAN UNION WILL BENEFIT AND AMERICA WILL BECOME RICH AND POWERFUL. THERE ARE GREAT ADVANTAGES AND BENEFITS IN ALL REGARDS. But Turkish leadership seems absolutely essential." "But Anatolia is not like that. For example, they will go hungry themselves in order to feed their guests, and will give them the finest beds to sleep in. They will be cold so that their guests can sleep in the warm. But you cannot find such elevated moral values anywhere else in the world. Egoism and selfishness are the order of the day everywhere else. These moral virtues need to prevail across the world. That is only possible through the Turkish-Islamic Union and through Turkey playing the role of leader and older brother in the region. In that event, there will be no more terror or suffering or anything else. Armenia will benefit, Israel will benefit, Palestine will benefit, Egypt will benefit, Iran will benefit, America will benefit and Europe will benefit. Europe will grow richer and America will become richer. This union will bring a magnificent peace to the world. This is an urgent need, and is not a claim to any racial superiority. It is a claim based on the superiority of love and moral virtue. It is a wish to bring greater moral virtue to the region." Erdogan called for stability for the Caucasus, which turned into a battleground for Russia and the USA, and for co-operation for all. 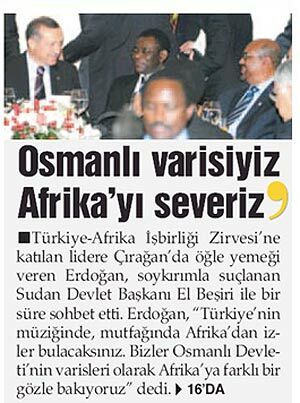 Erdogan said: "… We say that nobody should seek to benefit at the cost of others in international relations. There can be no gain from conflict. Harming peace and stability in the Caucasus, in a way to incite deep conflicts, will have serious results for global peace and stability. … we are calling for a competition based on co-operation, from which all can benefit…"
Prime Minister Tayyip Erdogan said there was nothing to be gained from conflict, and warned that harming peace in the Caucasus would have serious results for global peace and stability. 3. The historic rapprochement between Turkey and Iraq that began with a visit by Turkish Prime Minister Tayyip Erdoğan. By Allah’s leave, these are all initial steps. As Mr. Oktar has many times stated, Turkey will soon become a regional superpower and take its place on the world stage as a great state that distributes justice, maintains balance and provides security. PRESENTER: Yes. We have come right to what I wanted to ask about. We have talked about the examples of Iraq and Palestine, but dramas of this kind are taking place all over Muslim lands. There is still no unity in the lands of Islam. What is Turkey’s responsibility in that respect? 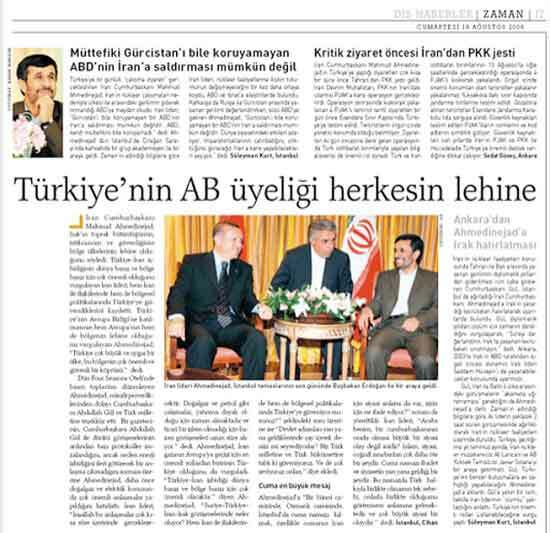 ADNAN OKTAR: Turkey’s duty is to lead the Turkish-Islamic world. The Turkish nation has a huge responsibility. Leadership of the Turkish-Islamic world is of the greatest duties in history. THIS IS ONE OF THE CRUCIAL TASKS FALLING TO THE TURKISH NATION. We, the Turkish nation, have a duty not just to save Turkey, but to save the entire Turkish-Islamic world. The Turkish nation is truly unlike any other. This is not racism, but Turks are loyal and very good-natured. They are humane. And very compassionate. And unbelievably self-sacrificing. Go to any village. Go as their guest. They give guests the very best places, the finest food, the most comfortable beds, and offer them the best glasses to drink from. What does this mean? It means that our people are not egotistical or selfish, but are a loving, loyal and joyous nation. They long to give their lives up for Allah. KAÇKAR TV: Would there be any problem regarding national frontiers? ADNAN OKTAR: The idea is a structure resembling a Union of Republics with every component state inside its own borders. 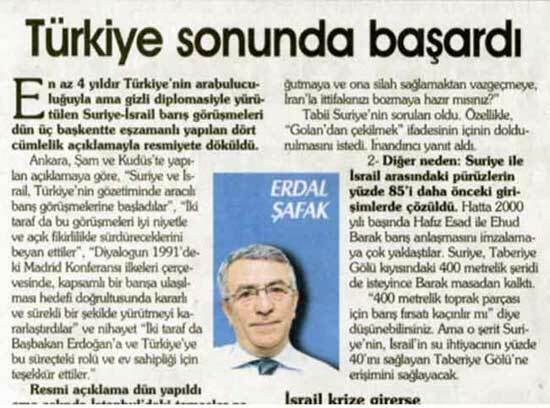 KAÇKAR TV: So you say it is possible. ADNAN OKTAR: Of course. This will put a stop to anarchy, terror and chaos… The region is currently ablaze. The Middle East is in a terrible state; everyone is unhappy. Palestine is unhappy, and Israel, too. And Syria, and Iran. More or less everyone in the region is uneasy. This union will entirely eradicate that unease. KAÇKAR TV: So Iran could also be included in it. 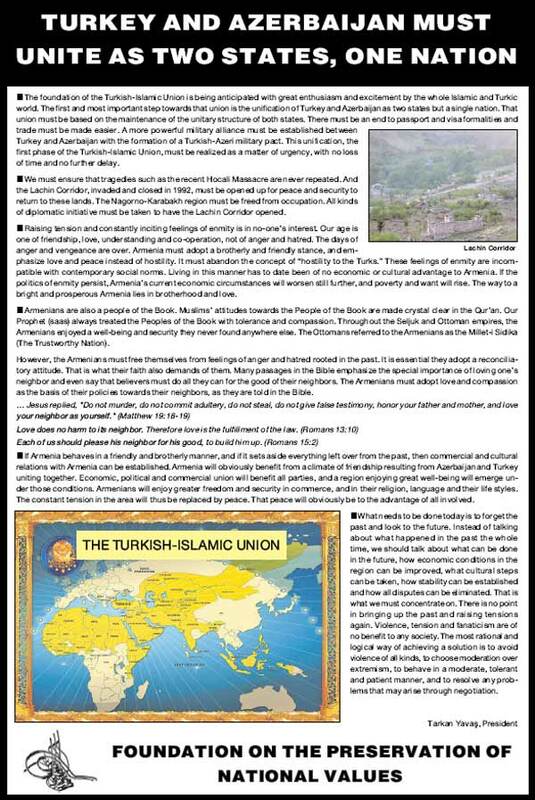 ADNAN OKTAR: InshaAllah we have the idea of a great Islamic Union. Along the lines of a Turkish Islamic Union. We have an idea regarding the Muslim world being the greatest superpower. It will unify the whole Islamic world and the whole Turkish world UNDER TURKISH LEADERSHIP AND GUIDANCE. The Turkish world is in any case made up of Muslims, I am merely saying that for reasons of clarity. In other words, it means that an Islamic Union will emerge at the same time. We believe that this unification will bring with it peace, plenty and prosperity. We think that wars will end, and that the money now spent on wars will instead be spent in ways beneficial to mankind. And we believe that the time for this is at hand. Our fundamental belief, however, is that the Turkish Islamic Union will come about with the appearance in the End Times of the blessed Mahdi. And we believe that the Prophet ‘Isa (as) will also return and that it is at hand. We believe in the coming of the Prophet ‘Isa (as) as set out in the Qur’an. We believe that the Prophet ‘Isa (as) and the blessed Mahdi will combine together and usher in a delightful age of prosperity and plenty in such a way that Islam will be the only faith on Earth.